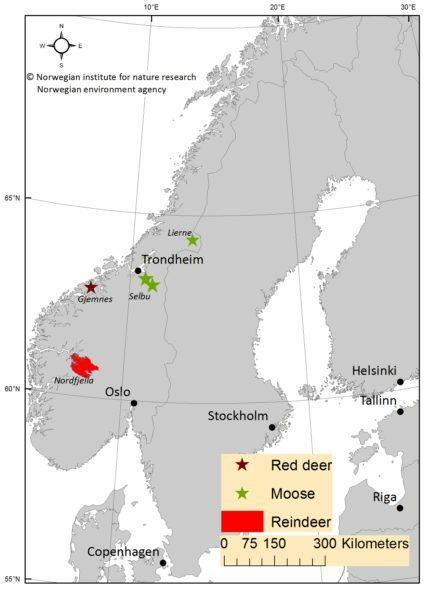 Chronic wasting disease (CWD) was diagnosed in March 2016 in a wild reindeer (Rangifer tarandus) from the Nordfjella mountain area in Norway. This was the first documented case of CWD in Europe. In May and June 2016 CWD was diagnosed in two moose (Alces alces) in Selbu in South Trøndelag county, approximately 300 km north from the first case. CWD is a contagious prion disease that is lethal in cervids, which includes reindeer, moose, red deer and roe deer. The disease is only found in wild reindeer in the Nordfjella mountain area, and the population in Nordfjella will be eradicated in an attempt to eradicate the disease and avoid spreading. The Nordfjella mountain area is divided in two zones, and it is the approximately 2000 animals in the northern zone (zone 1) that will be eradicated. The Norwegian Food Safety Authority and The Norwegian Environment Agency has made an eradication plan on behalf of The Ministry of Agriculture and Food for the eradication of the reindeer population in zone 1.